I remember the first time that I really allowed my deepest secrets—my deepest pains—to make it into the pages of a novel. I had written a lot of “romance-y” stories and none of them got close to getting published, but then there was a book that broke my heart. It was the story of a women imprisoned by her enemies and another woman who dared to help her. It was a World War II story that included a pregnant woman abandoned by her husband. I FELT the pain as I wrote. My former boyfriend left me when I was pregnant. My tears fell onto the page as I wrote. And THAT was the book that got published. It was a book that was hard to write, but when we write about hard things we connect with readers in ways that go heart-deep. What books changed your life? Share w/ @TriciaGoyer and enter to win a Roxanne Henke book! What authors’ books have changed your life? Share with me in the comments below, and you’ll be entered to win one of three copies of Roxanne Henke’s Becoming Olivia! Only those in the contiguous U.S. are eligible to win due to shipping costs. Winners will be announced next week on my blog and on my social media! The book that has changed and is changing my life is the Bible. Great advice. 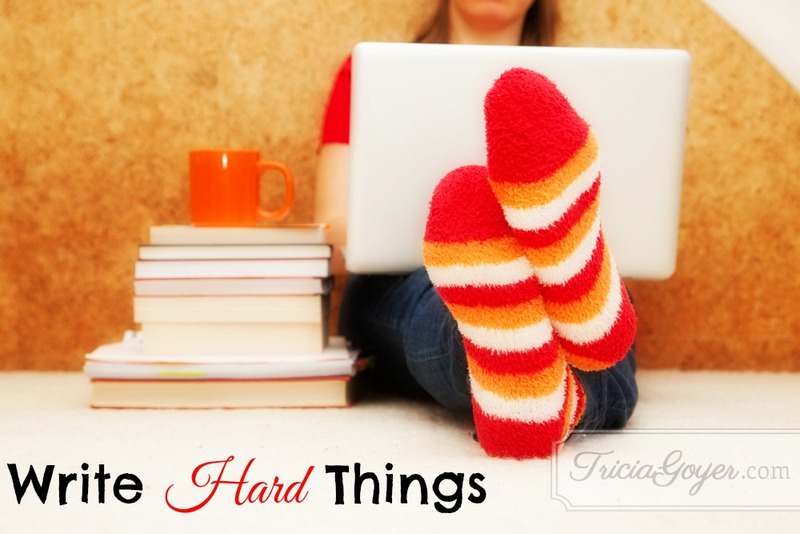 Writing the hard things isn’t easy but I’ve discovered when I do it is the post that tends to get the most attention. Book that has changed my life… The Bible. I’m looking forward to reading through it with you and the many others this year. Pastor Pete Wilson also really got my attention with his new book, Let Hope In. The Bible, of course, is The Book that changed my life forever. Sarah Young’s devotional Jesus Calling has also been a constant companion in my morning quiet time. I write legal briefs for a living now, but am anxious to write either fiction or non-fiction to help bring women out of the darkness and into the Light of the World.as I build a ministry for them. Thanks Tricia for these stories. They are inspiring to me as I embark on a writing and ministry mission. Thank you all for sharing the things in your lives as authors. I would also have to say the Bible because it brought me to Christ many years ago. There have been many others that have built up my faith but the writings by Billy Graham also deeply influenced me. The Bible is the book that changed my life. I grew up in a Jewish home. When my first husband died, I went to our temple and asked them to bury him. Because they told me that he only showed up there to see the kids perform, they would not do it. I started doubting my heritage. I finally found a Rabbi that would bury him and in the 3 hours we talked on the phone,he knew more about my husband, than my Temple ever did. But when money got tight, I moved myself and my 2 children to Florida. I was seeking something different, a friend from Ca. took me to her church and I asked if she had a Bible I could read, she lent me one and one night I sat in my livingroom and read it from cover to cover. Something changed in me at that time. After moving to Florida, I met some people, one woman kept inviting me to her church, after my kids went to church with her kids, they asked if we could go. Finally, I said yes, We went to church and about a year later, the 3 of us converted to Christians. Reading the Bible that night from cover to cover opened my eyes and I am still a believer, I know that God has Blessed me over and over and I live for Him now. Other than the Bible, I’d have to say A Confident Heart by Renee Swopes has changed my life. I didn’t think that it would make me more confident when the online bible study started it, but oh my word…it totally did! I feel so much more confident! Besides the word of God, so many books have changed my life I can’t even share them all or think of which one was that individual one that impacted it the most. I read a book recently by Dr. Braxton Cosby called “The Windgate”. It definitely changed my life as far as how I view spiritual gifts and talents. I agree that the Bible is a life changer. Women of the Bible taught me a lot about hardships & rewards. Other than the Bible, a book that stands out in my mind over the years is “Redeeming Love” by Francine Rivers. It is a wonderful reminder of how God loves and redeems us in spite of our repeated sin. I just looked through my “Read” books list and so many have stayed with me. The Orphan Train, The Five People You Meet in Heaven, Those Who Save Us, Snow Flower and the Secret Fan and Heaven is for Real are the ones with the biggest impact. I tend to take away a lot from most books I read. Some books just touch me deeper. Ah, actually, the very first book that changed me was Mandy, by Julie Edwards Andrews! I was 9 yrs old and this was the first book that totally sucked me in and I was in the story. It was also the first book that got me excited about storytelling and writing. A book that changed my life was, “Paul: A Man of Grit and Grace” by Chuck Swindoll. It spoke God’s truth to the situation I was facing at the time and encouraged me to keep trusting God. I shared the book with my husband and with my dad. It impressed God’s love and capability through its message. I’m grateful to God for this book. “Anything” by Jennie Allen, “Graceful” by Emily P. Freeman, and “One Thousand Gifts” by Ann Voskamp are among my MANY favorite, life changing books! the book that changed my life has to be the women of the bible I love learning about the people of the bible. cool book. Are You There God? It’s Me, Margaret by Judy Blume. When I was in sixth grade, this was the hot item that started discussions. Among others, but this one really stands out and most impacted my preteen years. Even though I learned to read I found that it was challenging and often very difficult. Then when I was in the seventh grade I went though a day of testing and it was then that I found out that I had dyslexia and at that time there really wasn’t a lot out there to help a child like me. So I went though school being laugh at and being in LD classes. Then a dear friend gave me the book ” Love Come Softly” by Janette Oke for my nineteenth birthday and that book really opened my eyes to reading. Now some thirty years later I always have some kind of a book in my hand and I love reading though it is still sometime hard I stick with it. The book that changed my life was The Geography of Happiness. The Bible is the number one book.And right now Tricia your amish devotional is helping me alot. Roald Dahl’s books have influenced me as a child on up through adulthood with his short stories for adults. So many lessons can be learned from his sometimes wild and always odd stories. Francine River’s Redeeming Love. I found my own story buried within the pages. Too many to list but Bible is at the top of the list. I can’t think of one particular book that has changed my life. I read Christian fiction and non fiction constantly. Each book I read has affect me in some way or another. I learn something from all of them. Whether it is how to handle a situation or how not to handle it. I can tell a big difference in my attitude and way of thinking since I started reading Christian books many years ago.. I just wish I had discovered them when I was young. It would have saved me from a lot of interesting and difficult learning experiences. Dee Henderson (God love her heart). I was looking for a new author. Picked up her first book in the O’Malley series. I had been saved as a young child, but had drifted away from church and God. While reading this book, I took the journey with the character of finding my way back to God. I finished reading the series and found received many blessing from it. I am back in church and couldn’t be happier. The Bible of course! Karen Kingsbury’s books have been great too! The book which changed my life is the Bible! But I will say that those who write about the Amish – they make me want to be a better person! The comments of the authors are touching and resonate. I pray I can do justice to the stories that draw from my own life. The most important, life-changing books for me are: The Bible, Creating a Life Worth Living, In His Steps, A Gentle Persuasion (a different take on evangelism), and The Cinderella Syndrome. Wow, what a hard question to answer! I would have to say all the Christian fiction books that I have read. (historical and Amish, mostly) I always seem to be able to identify with the main character and always finish the book with a major lesson learned. I want to thank Christian writers for their gifts and talents they share with the world – and me! Without a doubt The Bible. There are a bunch of amazing authors like Karen Kingsbury, Lori Wick, Janet Tronstad, Jillian Hart, Dee Henderson and so many more that got me through some really hard times in my life…but there is just nothing like The Bible. Janet Evanovich brings humor to my life. Laughter is good medicine. Like so many others who have commented, the Bible is one book that you can read over and over again, and always find something new or something that helps a person through life. During most of my life, I read anything I could get my hands on (I had read through most everything in our small town library by the time I was 7 and then everything on the bookmobile by 7th grade). There was no Christian fiction genre. When the Left Behind series started, a friend lent me a copy of the first book. I returned it several weeks later unread. Sometime later, I got a copy at the library and read it through in one day. I was hooked. I read the entire series, then the kids (teen) series, which was also amazing. Then I started reading Beverly Lewis’ Amish stories, and now I read everything Amish I can find, even nonfiction! I do occasionally read things other than Christian fiction, but not often. The book that changed my life was The Torah. In my humble opinion, I don’t believe any humanly written book has the power to change a life like the inspired Word of God. I have been influenced by many books in many ways. However, as I read the post, I also had to admit that I have not read any of the books mentioned. When I sit down to read, I am escaping from reality. I do like a little adventure or perhaps a dilemma or two, but any book that delves into the reality of all the hurt & sorrow I see & hear daily is not what I read for enjoyment. I don’t want to be “scared silly” or cry “buckets of tears.” Can anyone else identify? Aside from The Good Book, CS Lewis’s writings, because they have helped to point me to and draw me closer into God’s Word. Joel Olsteen books. The Bible too. The Bible totally changed my life. A work of fiction would have to be Anne of Green Gables. L.M. Montgomery totally made me feel so refreshed reading about Anne. I believe it was Lisa Samson’s “Club Sandwich” which really spoke to me. It gave a name to what I was going through at the time, being a member of the Sandwich Generation- caring for a family and caring for an aging parent. Now we are empty nesters and both of our mother’s have passed on, so life has changed and will keep changing. Thankful to know that the Lord is in control. The Bible; Celebration of Disciplines by Foster, and Past Forward by Chautona Havig! Grace For the Good Girl by Emily Freeman and Everything by Mary DeMuth have both been life changing for me. God and His Word has made the biggest impact on my life, but if your asking about a recent book that has brought scripture alive and encouraged me to step out from underneath myself “When A Women FInds Her Voice” by Jo Ann Fore. The Bible changed my life at age 5 when I accepted Jesus into my heart. The second book was “A Tree Grows In Brooklyn”. The family learned to overcome being poor and helping themselves and I have done that all my life. The Bible and Steps to Christ.